The Department of Regulations and Military Science Research, the forerunner of the Department of Military Science (hereinafter DMS) came into being on April the 10th, 1958. Since its inception, the DMS has closely followed realities and employed multiple measures to successfully fulfil its assigned tasks, greatly contributing to the victory of the nation’s previous resistance wars as well as current Homeland construction and defense. The DMS under the Ministry of National Defense (MoD) is mainly tasked with counselling and management vis-à-vis science, technology and environment within the military. For over the past 60 years, generations of the DMS’s staff have ceaselessly strived to successfully fulfil their assigned tasks, contributing to the development of Vietnam’s military art theory. Noble rewards have been conferred on the DMS by the Party, the State and the military in recognition of its contributions. At the time of our resistance war against the US for national salvation, the DMS undertook research studies on people’s war, military art, etc. to contribute to our victory against a top-notch professional army who overtook us in many aspects. The DMS thoroughly grasped the Party’s guidelines which were to proactively attack the enemy, “to pit the small against the big”, “to pit the few against the many” and to employ the art of people’s war. It also sent its veteran staff to the battlefield. As a result, its research studies always stayed close to reality, and demonstrated a high level of feasibility, thereby contributing a lot of scientific arguments to the Party, the State, the MoD, particularly the General Headquarters of the Vietnam People's Army regarding new war-fighting methods and the handling of toxic chemicals. Thanks to those studies, a great deal of materiel was either invented or modified while valuable training manuals were produced. All of these made great contributions to our struggle for the South liberation and national reunification. During the period of Homeland construction and defense, with its new capabilities and status, the DMS has worked on a great number of valuable research studies on military science while properly advising the Party, the State and the MoD on the theories about all-people national defense associated with the posture of people’s security and defensive areas, national defense combined with economy. 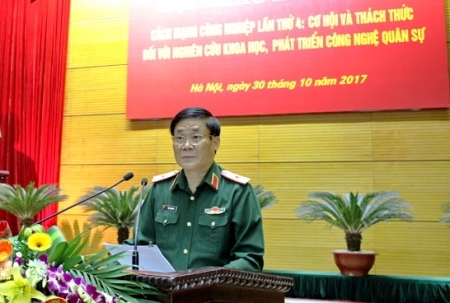 These have enabled Vietnam’s military art to develop gradually, the political-ideological basis to be consolidated, the working class’ nature to be strengthened, the qualities of “Uncle Ho’s Soldiers” to be promoted, the content and format of Party work and political work to be renovated, “peaceful evolution” attempts and subversion activities by hostile forces to be foiled. The DMS has proactively collaborated with agencies and units inside and outside the military in researching and applying science and technology to command, training, logistics and modified materiel to match the reality, the development of military art and the enemy’s war-fighting operations aided by hi-tech weaponry, contributing to making the military revolutionary, regular, seasoned and gradually modernized to firmly safeguard our Homeland. In the meantime, the DMS has actively advised the Central Military Commission (CMC) and the MoD on military environmental management, supervised, investigated and disciplined the MoD’s affiliates implicated in environmental pollution while participating in the State management activities pertaining to water resources, maritime resources, and radiation safety. It has closely cooperated with domestic and foreign organizations in undertaking clean-up projects in dioxin-contaminated locations to serve the country’s socio-economic development. Nowadays, the 4th Industrial Revolution and the task of Homeland construction and defense in general, military build-up in particular set a more demanding requirement for military science. In order to enhance the quality of military science in the time to come, the DMS should synchronously employ measures with emphasis placed on the following. First, enhancing the quality of advice on science, technology and environment for the CMC and the MoD. To this end, the DMS should thoroughly grasp and effectively implement resolutions and directives by the Party, the State and the military on science, technology and environment, particularly the 11th Central Party Committee’s Resolution 20-NQ/TW dated November 1st, 2012 on “Developing science and technology to serve the cause of industrialization and modernization amidst socialist-oriented market economy and international integration”, the CMC’s Resolution 791-NQ/QUTW, dated December 30th, 2012 on “Leading the work of science, technology and environment within the military until 2020 and beyond”. Accordingly, the DMS should properly advise the CMC and MoD measures for science, technology and environment in the short, mid and long term, even on a periodical, annual basis in line with the military’s tasks, the national economy and international situation. Attention should be paid to building a contingent of science researchers with a high degree of morality and competence. Moreover, it should closely cooperate with agencies and units inside and outside the military in analyzing, assessing and predicting the situation as regards military build-up and Homeland defense. It should regularly update scientific advancements, particularly in military science to avoid being plunged into passivity. At the same time, more scientific arguments concerning ideology and theory should be developed to help the Party, the State and the military to repudiate erroneous viewpoints, contributing to protecting the Party, the State, the regime and the Homeland in the new situation. Second, enhancing the management, direction and guidance to enable agencies and units throughout the military to develop more valuable scientific products. As the military’s flagship in charge of science, technology and environment, the DMS has proactively employed numerous measures for boosting its task performance while supervising the military’s agencies and units working out research programs/projects to ensure scientific-technological products a high degree of feasibility. The DMS should invest its efforts in contributing ideas to the National Defense Strategy and the Military Strategy and issuing operational regulations close to reality with priority assigned to the development of theory about people’s war, all-people national defense associated with people’s security and the posture of “people’s hearts and minds” in the new situation. Furthermore, it should strive to master a number of scientific-technological advancements, to actively design, to modify and to gradually modernize materiel to meet the requirements set by the military’s units and forces that will proceed directly to modernization. Third, synchronously implementing mechanisms and policies to organize and manage scientific, technological, environmental activities. This is important as it brings those activities into line with the State’s regulations, social development, and military tasks. It also encourages development in scientific research. To this end, the DMS has counseled the CMC and the MoD to opportunely amend legal normative documents on science, technology and environment and international cooperation within the military, thereby laying a legal foundation for effective management and improved performance of scientific, technological, environmental activities. The organizational structure should be strengthened of managerial bodies and research institutes throughout the military while the planning and budget allocation should be reformed, thereby promoting competence and attracting talent among individuals and collectives as regard science research and management. In the time to come, importance should be attached to placing an order for research tasks, gradually piloting scientific-technological enterprises, “socializing” a number of research institutes, and upgrading research facilities such as labs, pilot plants to increase the effectiveness of scientific-technological activities. Today, developing military science is a matter of importance and urgency. Therefore, agencies and units should devote due attention to scientific, technological and environmental research to contribute to making the military revolutionary, regular, seasoned and gradually modernized, thereby firmly safeguarding the socialist Vietnamese Homeland in the new situation.